Materials and biophysical characterization company Malvern Panalytical. 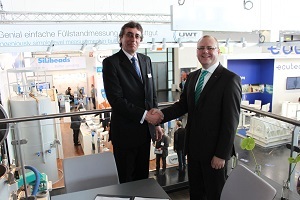 (Malvern Panalytical, UK) and NETZSCH Grinding & Dispersing (headquartered in Selb, Germany), a worldwide manufacturer of industrial wet and dry grinding, mixing, dispersing and kneading equipment, have entered into a cooperative marketing agreement. Both organizations serve a broad range of market sectors from pharmaceuticals, ceramics, nano-technology applications, food and surface coatings through to mining metals and minerals. The global agreement, initially in place for three years, will harness the strength of each company’s world-leading brands and unique expertise in materials processing and materials characterization. Under the terms of the agreement NETZSCH will standardize on Malvern Panalytical’s particle sizing and characterization equipment, primarily the Mastersizer 3000 laser diffraction particle size analyzer. Customers and prospective customers of each company will gain access both to the extensive milling knowledge of the NETZSCH teams and to the particle sizing know-how of Malvern Panalytical. This combined approach supports the further development of solutions and services to meet increasingly specific individual customer needs. Initially, Malvern Panalytical Mastersizer 3000 systems will be installed in NETZSCH demonstration and test laboratories in key territories around the world - Germany, USA, Brazil, China, Korea, India and Russia. All trials, demonstrations and toll-production carried out by NETZSCH on customers’ materials in NETZSCH facilities will be routinely tested using Malvern Panalytical instrumentation, with Malvern Panalytical’s applications experts in each territory available to support the understanding and interpretation of data, as required. Jointly organized seminars and other initiatives will be targeted at key market sectors to deliver valuable information and support to customers and potential customers of either or both companies.